With a stay at Hotel Sonu Dx @ New Delhi Station in New Delhi (Paharganj), you'll be within a 15-minute drive of Jantar Mantar and National Museum. Featured amenities include dry cleaning/laundry services, a 24-hour front desk, and luggage storage. A roundtrip airport shuttle is provided for a surcharge (available 24 hours). When you stay at Palkiya Haveli - A Heritage Home in Kota, you'll be near the airport, within a 5-minute drive of Kishor Sagar and Kota Fort and City Palace. 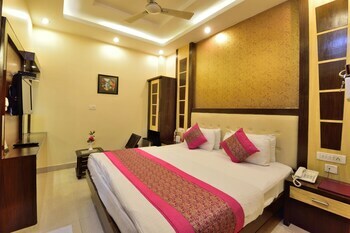 Located in Amritsar, OYO 1605 Hotel Axis Inn is connected to a shopping center, a 4-minute drive from Hall Bazar and 5 minutes from Mall of Amritsar. Free self parking is available onsite.